How one short story led to a new friend, inspiration, and 3 new books, in one night. As we walked up to the entrance of Cafe Nola in Frederick, MD I noticed the sound coming from the open front door was different. This wasn't the sound of small groups of people sitting at tables and enjoying dinner; no, this was louder, more energetic, like near the end of a wedding reception with an open bar. We walked in and saw a table set up by the door with two girls attending it, obviously checking people in with name tags. We graciously smiled as we walked by them, not feeling a need to explain why we were just walking into their private party. The place was at capacity with everyone standing and talking with drinks in their hand. Whatever function was happening was in full swing. We were two hours away from needing to set up our gear so we found an empty tall table with stools in the corner and put our food order in. I knew the bathroom was on the complete other side of the building and I would have to squeeze through about 10 separate groups of people in tight circles chatting, so I decided to make a proactive move for once and do this before the food came. As I was walking back, alternating between trying to make myself small to squeeze through, but also actively pushing my way through the small gaps of light between people with the perfunctory, " sorry...sorry..excuse me," I noticed a small rack of local rags and papers near the door. I'm not sure why I grabbed the most simple looking one there, just a folded piece of white paper with a black and white drawing up top and words upon words below. Maybe it was because there were no advertisements anywhere to be seen on it, and the possibility of finding something without a commercial interest is always welcome. Or maybe the title "The Stone Bird" was just interesting enough that it was worth the chance of finding out more. Either way, that's the one I took back to the table to break me out of the habit of just scrolling through mindless posts as we wait on our food. If you ever see a table of five guys paying attention to anything but each other, and most likely their smartphones, then there's a good chance they're a band that has just ridden 7 hours in a tiny van with each other and feel no need to make small talk to pass the time. Tired of small talk and tired of the phone, I wanted something else engaging. The writing started off...not weird, but just peculiar -- birds who want to fly into space and then quickly got into some scientific history of the albatross. Were these just ramblings? A study of schizophrenic albatross birds? I didn't know, and I could feel my attention starting to wander away. I looked up and scanned the room for any other alternatives but quickly remembered why I picked up this paper in the first place, so I kept reading. Then something happened, a little nugget of wisdom was dropped into the story from nowhere. A little phrase or idea that caught me by surprise and made me think, "Wait, could this be good?" Little did I know that I would be leaving there with a new friend, inspiration, and three free books. The story of the Stone Bird follows two albatross who are life partners but are not able to conceive during the annual mating, a reproduction ritual that takes place on a special island every year. The female makes a rash decision to use a small round rock and tell her partner that this year she has finally laid an egg just like all the other couples. Through sheer volition of true love, this rock hatches into a stone bird and now they have a family. I couldn't stop reading this story. Every paragraph had a tiny little nugget of wisdom, much like my favorite author Tom Robbins. Writing like this is special, and the chances of my discovering something like this in a quaint little town in Maryland were quite surprising. I finished the story, and little did I know that my story with this experience was just beginning. 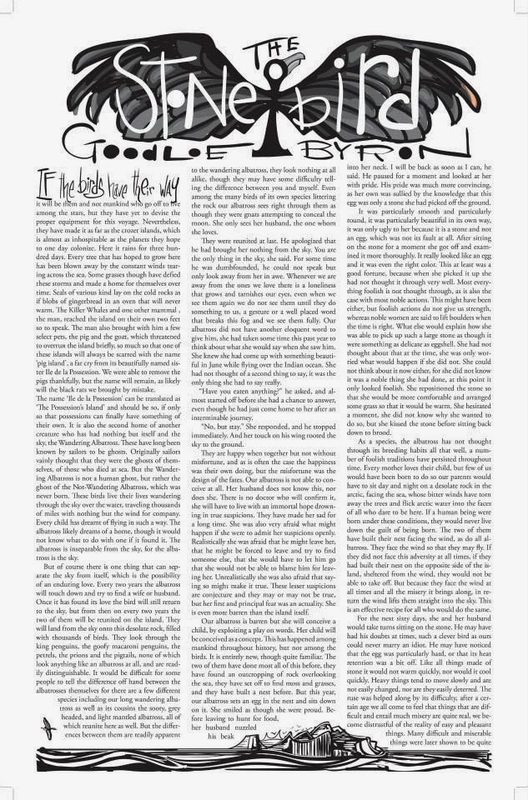 At the end of the story there was a simple little postscript of "My name is Goodloe Byron. If you like the story email me....." It hit me then that whoever wrote this story published this little paper by themselves and left them in places like this, cafes and restaurants, for people to discover. No advertisements, no sales offers, no asking of money, just a small request for acknowledgment. That's it. The simplicity and beauty of this deal was too much to ignore, and I pulled out my phone and shot him a quick email just saying, "Hey, I loved your story. Thank you." I know from traveling around playing music that the smallest things like that can make a huge difference in the day for someone baring their soul through their art. This small little sample of independent writing had me fired up, to be completely honest, so that when I found some friends that we met our first time here, I quickly described how I came to the story and how much I liked it. They both laughed and said, "That's Goodloe. Everyone in town knows him. He'll be here tonight." They told me that he's also a musician and visual artist, and you know you're a Frederick local when he draws a picture of you. So not only have I discovered a beautiful story but I'm going to meet the author soon. A mental image appeared of what this guy might look like and if I could recognize him. I'm sure he'll be the most outlandishly dressed person here...obviously. Bright colored pants, some type of fedora-esque hat with feathers around it, or maybe even a Native American vibe with amulets and pieces of bone hanging from all points. A few minutes later an average looking guy with moderately short hair and a cropped beard stood in front of me in jeans and a brown jacket. Just a normal looking dude. My friends said, "Hey, this is Goodloe." "I just sent you an email about 20 mins ago," I said. He laughed and said, "That was you?" I was reading it on my way here and it really made my night, thank you." We didn't talk long since he had to get to an open-mic night to perform, but he said he would be back for the end of our show. We finished playing and he came up and handed me three of his self-published books, "Here you go, I hope you like them. You guys sounded awesome." Not a lot else was said. 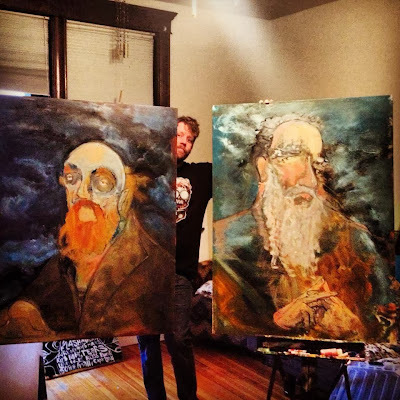 We'd both experienced each other's art, and it felt like a mutual respect had settled in that didn't need to be strengthened through banal small talk. With tools like Facebook in today's world, you don't need to make as much initial effort to stay in touch. If there's someone you want to keep in touch with then you will: it's simple. It is amazing what can happen when you follow your gut and just reach out to a stranger and say, "I appreciate your work." Every now and then a whole new world might be opened up to you. Not always, but when it does it is pretty special and worth the effort. I'm several chapters into one of his books and love it so far. This was a really special experience that I felt honored to be a part of. Goodloe is sending me some copies of his Stone Bird story. So, if you're interested in reading it, find me and ask.